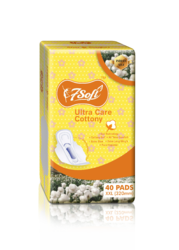 These products are skin friendly in nature, Cotton Sanitary Napkins are extreme soft in nature. We are engaged in offering Hospital Uniform, Men’s Apparels, Ladies Apparels and many more. The products are quality approved and perfectly stitched. To cater the variegated needs of our esteemed customers, we are highly engaged in offering a wide array of Dry Net Regular Sanitary Napkin. Features: Maintain Hygeinic with super absorbant capacity. Our clients can avail premium quality of Maternity Sanitary Pad from us. Maternity Sanitary Pad is being used in hospitals in gynecology section, these pad are highly absorbent. These pad are made of fine quality fabric employing latest technology. All the pad are hypoallergenic so as to avoid any kind of infection. The pads offered by us are easy to use with all the instructions. We hold extensive experience in offering superior quality Disposable Maternity Pads. Our maternity pads come with excellent absorbent capacity and unique design which enables them to serve its utility to the fullest. These products are available in the market at reasonable rates. We are offering customize size.